With summer in full swing, being mindful of one’s food in maintaining a healthy body and mind is all the more important. Bogging your body down with heavy, fast food-style meals will do nothing to keep you replenished with all of the vitamins and minerals you need to stay fresh, hydrated, and feeling your best. Luckily, PlusSea’s rich menu – spanning cold and hot appetisers, soups, pastas, risottos, fish and seafood, meat dishes, light salads, and more – is on hand to inspire: in what could you indulge that is both nutritious and fabulously flavoursome? 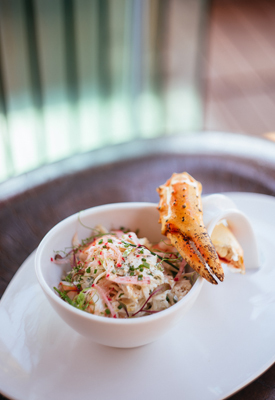 Look no further than the radish and celeriac salad embellished with prawn and crabmeat, and a light Dijon mustard dressing. Prawns are an excellent, low-fat source of protein, rich in calcium, potassium, and vitamins A and E. Crab, meanwhile, is likewise brimming with essential fats and nutrients, and has been associated with increased cognition, boosting of the immune system, stimulation of the circulation, and detoxification of the body. Need more convincing? Combined with cool and crisp radish and celeriac – both containing high amounts of fibre – this dish makes for the ultimate summer superfood!